Persistence is the cornerstone of victory. 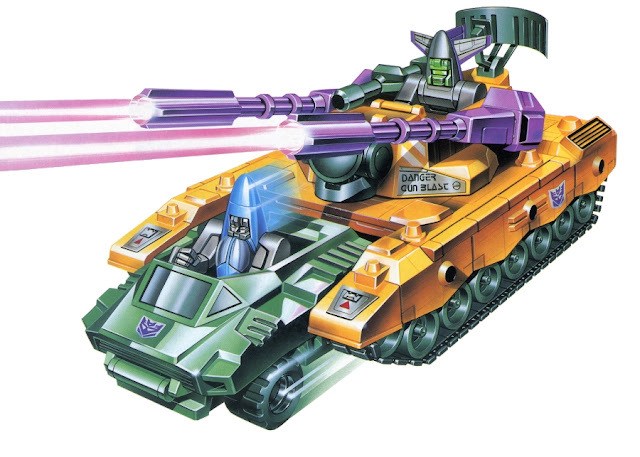 One of the most powerful Decepticon weapons ever. Commanded by Spaceshot and Blackout that combine to form a B-1 bomber jet. Able to plot a course of attack in the middle of battle, change maneuvers to match the enemy and emerge victorious. Often circles overhead during battle, surveying the battlefield and providing air and ground support when necessary. Tank armed with sophisticated all-terrain and underwater attack capabilities. Also armed with dual 50mm cannons for long range firepower. In battle station Mode, outfitted with 3-stage photon rocket launcher, heat-seeking stun laser and turret that converts to devastating gun emplacement. On-board computer radar guidance systems and automated repair bays provide additional ground support. Self-propelled scout vehicle fully equipped for short range reconnaissance missions, and can reach speeds in excess of Mach 1.